Agnieszka Radwanska, the runner-up at Wimbledon in 2012 and the Bank of the West Classic at Stanford in 2013, announced her retirement today at age 29. "Unfortunately, I am no longer able to train and play the way I used to, and recently my body can't live up to my expectations," Radwanska, a petite 5-foot-8 (1.73 meters), said in a statement. "Taking into consideration my health and the heavy burdens of professional tennis, I have to concede that I'm not able to push my body to the limits required." Radwanska became the first Pole to reach a Grand Slam singles final in the Open era, catapulting her to a career-high No. 2, and the first to win the WTA Finals (2015 in Singapore). She reached two Australian Open semifinals and one French Open quarterfinal, won 20 WTA singles titles and earned more than $27.6 million in prize money, seventh all time. 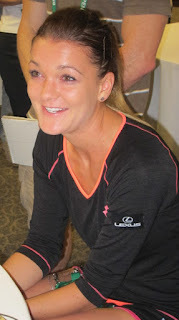 Known as "the Magician" for her crafty play, Radwanska was voted the WTA Fan Favorite for six consecutive years. Radwanska lost to Dominika Cibulkova 3-6, 6-4, 6-4 in the 2013 Bank of the West final after thrashing the Slovakian 6-0, 6-0 in the Sydney final six months earlier. Radwanska also reached the Stanford semifinals in 2010 and the quarterfinals in 2011 and 2015, the last of her six appearances in the tournament. The Bank of the West Classic moved to San Jose this year as the Mubadala Silicon Valley Classic after a 21-year run at Stanford. ATP Finals -- Fifth-seeded Mike Bryan (Stanford, 1997-98) and Jack Sock of the United States beat top-seeded Oliver Marach of Austria and Mate Pavic of Croatia 6-4, 7-6 (4) in London to improve to 2-0 in Group Knowles Nestor. Bryan and Sock, this year's Wimbledon and U.S. Open champions, are scheduled to play Pierre-Hugues Herbert and Nicolas Mahut (1-1) on Friday in a round-robin finale. In singles, top-seeded Novak Djokovic outplayed third-seeded Alexander Zverev 6-4, 6-1 and clinched a semifinal berth as he seeks a record-tying sixth title in the ATP Finals. Fifth-seeded Marin Cilic topped eighth-seeded John Isner 6-7 (2), 6-3, 6-4 to improve to 1-1 in Group Guga Kuerten. Isner fell to 0-2. Isner won his first pro title in the Shingle Springs Futures in the Sacramento area in 2007 and reach the Chico Futures final in 2006. Ten years ago, he advanced to the singles quarterfinals of the now-defunct SAP Open in San Jose and the doubles final of the $50,000 Sacramento Challenger with countryman Rajeev Ram.